Funny enough, I actually liked the seafoam color….but I had other plans for this room. The walls weren't primed when the wallpaper went up, because chunks of plaster came off with it. Super. Since there was plaster damage anyway, we knew we were going to have to skim coat to repair some of the worst areas. It probably would have been just fine to skim the walls, prime, paint, and call it 'done', but it is never that easy with me. No, the renovator in me wanted MORE. 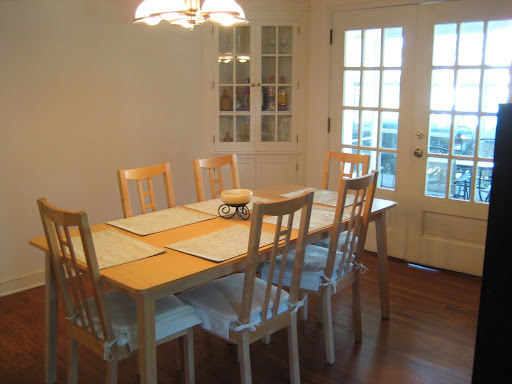 So I concocted a plan to add faux panel moldings and a chair rail to this room. My fiancé thought I was nuts at first, but with much convincing, he got on board and we both agreed this room was missing that something 'extra'. Here are the upper walls touched up with joint compound, the bottom of the walls perfectly smoothed out with heavier layers of compound, and the walls primed. Do you know why gray-blue primer was used on top? Oh, la la! Do I see dinner parties in my future? TomKat? GyllenSpoon? Call me! Now that is a handsome room, no? My apologies for my less-than-perfect photos.....but here is a great shot of the color (Antique Red by Behr) and the fabulous decorative moldings we added using paneling adhesive and our trusty nail gun. Don't the moldings just make the room? I did write up directions on how we did it here. I also found a $5 chandy on Craigslist and spray painted it, then found the Pottery Barn rug for $240 on eBay! 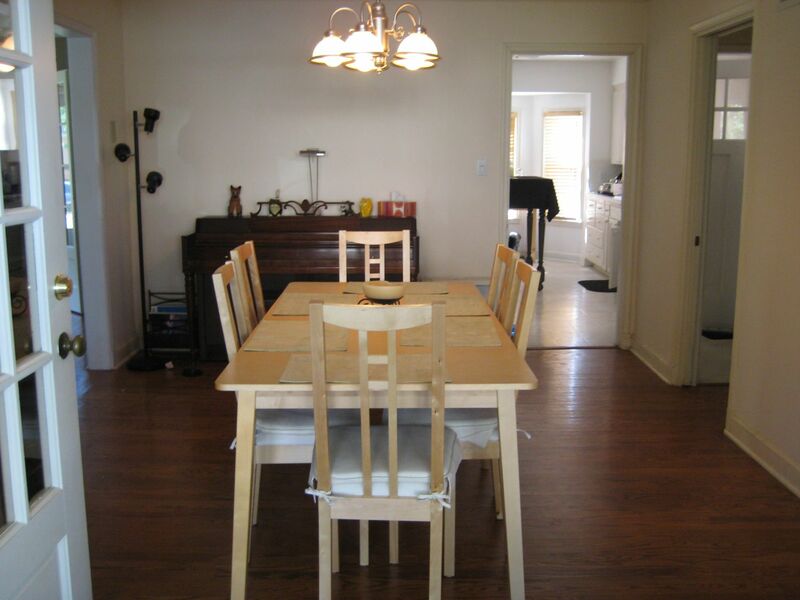 The last 'to do' items in this room include painting the french doors leading to the sun porch, and replacing the IKEA table set with a lovely pedestal table graciously donated to us by my future mother-in-law. Thanks, Gayle! Smooches and goodnight, blog friends. You were so right about the molding. It really makes the room pop. I also LOVE the built-in cabinets at the end. Gotta love the unexpected character you find in older houses. I know this post is old, but I figured I'd mention that we had that same light that's in your before pictures in our dining room when we moved in. Or it's rust-colored brother. Ick! I have been wanting to do moldings like that since re-reading a post on Bower Power. And we have a nail gun now. Sweet! I realize it's well over a year after you posted this, but I just decided to read your whole blog and I have to say OH HOLY WOW This room is BEAUTIFUL!!!! Good job. Great taste! Looking forward to catching up on your journey.